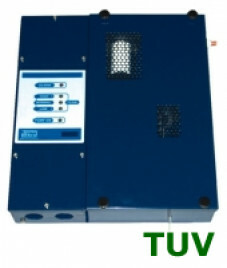 The system consists of a long lasting vibration pump electronically controlled by a flow sensor that keeps flow rate of sucked fumes even in the analysis cell. This solution has been planned to get even measuring rates in spite of the inevitable changes occurring due to depression in the stack, flow and temperature of comburent air, and a progressive growth of leaks in filters and suction pipimg due to the accumulation of impurity and moisture. AN510 is supplied equipped with SO105 – fume suction probe. The fume sucked by the pump through a copper dissipater is cooled down, separated from condensation water, then dried again trough a coalescence filter, and finally purified from the residual foreign matters through a further filter, before flowing into the analysis cell. Condensation water coming from the dissipater or coalescence filter, if any, is collected in a cell equipped with an electronic level gauge which drains it automatically through a valve.